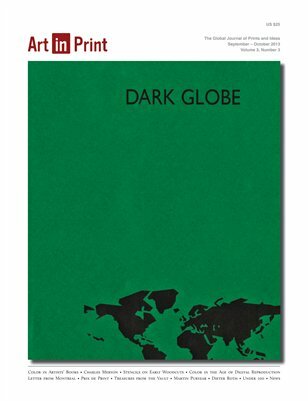 Volume 3, Issue 3 includes the articles Black Books: The Use of Color in Artists' Books; Charles Meryon: Paper and Ink; Coloring Within the Lines: The Use of Stencils on Early Woodcuts; A Letter from Montreal; Color in the Age of Digital Reproduction; the Art in Print Prix de Print No. 1: Jane Kent on Justin Quinn; Treasures from the Vault No. 2: Richard Axsom on Ellsworth Kelly's Red; Martin Puryear; Ian Davenport: Circle Etchings; Alain Biltereyst: Untitled; The Game-Changing Editions of Dieter Roth; Under 100; News of the Print World.